Growers in colder climates often utilize various approaches to extend the growing season or to give their crops a boost, whether it’s coldframes, hoop houses or greenhouses. It’s a pretty intriguing set-up that combines the principles of passive solar heating with earth-sheltered building. But how to make one?From American sustainable agriculture non-profit Benson Institute comes this enlightening manual on how a walipini works, and how to build it. The Walipini utilizes nature’s resources to provide a warm, stable, well-lit environment for year-round vegetable production. 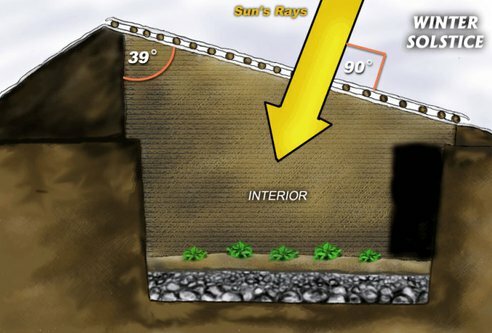 Locating the growing area 6’- 8’ underground and capturing and storing daytime solar radiation are the most important principles in building a successful Walipini. The Walipini, in simplest terms, is a rectangular hole in the ground 6 ‛ to 8’ deep covered by plastic sheeting. The longest area of the rectangle faces the winter sun — to the north in the Southern Hemisphere and to the south in the Northern Hemisphere. A thick wall of rammed earth at the back of the building and a much lower wall at the front provide the needed angle for the plastic sheet roof. This roof seals the hole, provides an insulating airspace between the two layers of plastic (a sheet on the top and another on the bottom of the roof/poles) and allows the sun’s rays to penetrate creating a warm, stable environment for plant growth. 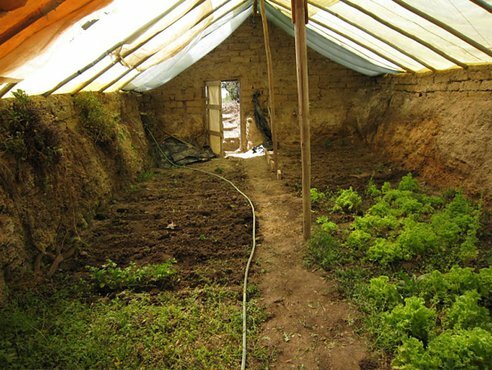 This earth-sheltered greenhouse taps into the thermal mass of the earth, so that much less energy is needed to heat up the walipini’s interior than an aboveground greenhouse. Of course, there are precautions to take in waterproofing, drainage and ventilating the walipini, while aligning it properly to the sun — which the manual covers in detail. Best of all, according to the Benson Institute, their 20-foot by 74-foot walipni field model out in La Paz cost around $250 to $300 only, thanks to the use of free labour provided by owners and neighbours, and the use of cheaper materials like plastic ultraviolet (UV) protective sheeting and PVC piping.